Watch the first trailer for Spider-Man: Far From Home below. 2018 was a great year to be a Spider-Man fan. He was a major player in the Marvel epic Avengers: Infinity War, got his own high profile game on the PS4. Venom, regardless of quality, was a major box office smash all over the world. Spider-Man: Into the Spiderverse was one of the best-reviewed films of the year and is now racking up major awards as the Best Animated film of the year. The Spider-Man hype train isn’t stopping anytime soon as Tom Holland will appear as the webhead twice in 2019. First in Avengers: End Game and then two months later in Spider-Man: Far From Home. The trailer for Spider-Man: Far From Home first debuted last year at Brazil-Con, and was mostly held off till now as to not steal thunder away from Spider-Man: Into the Spiderverse. Now everyone can watch it and get a look at the next crazy adventure Spider-Man will get into. Like the Muppets, Lizzie Maguire, and the Grisewalds before him, Spider-Man is going on a European vacation. The trailer gives an audience a general outline of the plot. 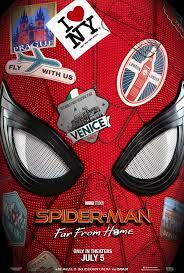 Peter Parker and friends go on a summer trip to Europe, and while Peter would like to have some time away from being a superhero, Nick Fury ruins those plans when he recruits Spider-Man for a mission. The mission in question involves The Elementals, who in the comics are a race of aliens who control the basic elements. Enter the mysterious new player, Mysterio (Jake Gyllenhaal) who originally appears as an ally to Peter but may be more in control of these Elementals then he is leading on. The casting of Jake Gyllenhaal is a nice in-joke for Spider-Man fans. Gyllenhaal was originally going to take over the role of Peter Parker/Spider-Man in Spider-Man 2 from Tobey Maguire when it was believed Maguire’s back injury would keep him from reprising his role. Gyllenhaal eventually found his way into a Spider-Man 2. Love is in the air. Not only is Peter’s romance with MJ (Zendaya) blossoming, and Happy Hogan (Jon Favreau) seems to have eyes for Aunt May (Marissa Tomei), but it appears Ned Leeds (Jacob Batalon) is in a relationship with Betty Brandt (Angourie Rice). She is seen taking a photo of him on the boat, her hand is on his shoulder in the last scene in the trailer, and Ned mentions how he ‘first knew he was in love’. In the comics, Betty and Ned are a couple, yet they have a more tragic end than we can expect here. In his first comic book appearance, Mysterio posses as a hero by faking an alien invasion. Since the Elementals are aliens it appears the two storylines have been combined, and the Elementals are actually creations of Mysterio. The Elementals also seem to be combined versions of their comic book versions with other Spider-Man villains. The water-based creature is a homage to Hydro-Man, the fire based one is Molten Man, and the earth-based one appears to draw heavily from Sandman. Meaning that the MCU version of these characters will be Elemental illusions created by Mysterio. While this makes sense to streamline these characters to better fit the plot and repeat any redundancy, it is a shame we will lose an interesting character like Sandman as just a one-off henchman. The year on Peter’s passports appears to be blocked out, likely an attempt by Marvel to keep audiences guessing if this takes place before Avengers: Infinity War or after Avengers: End Game. While J.B Smoove was not shown in the trailer, Remy Hii is seen in the new cast of students watching Mysterio battle Hydro-Man on the television. His role is still unconfirmed, but many have speculated he could be playing Harry Osborn. Since Spider-Man leaves his Stark suit at home, he is given two new super suits for the movie. The first and most prominent one resembles his Stark suit from Homecoming, but instead of blue under the arms it is black (a homage to the Superior Spider-Man suit from the comics) and a new black suit dubbed ‘the Stealth Suit’ that Fury gives Parker resembles the Spider-Man noir suit minus the trench-coat. Finally, the use of ‘I Wanna Be Sedated’ by the Ramones is another Spider-Man in-joke. ‘Blitzkrieg Bop’ was used in Spider-Man: Homecoming and the Ramones themselves did a cover of the famous Spider-Man theme song. Also ‘I Wanna Be Sedated’ was a name of the fictitious Ramones biopic in Entourage, where lead star Vinnie Chase was replaced in the Aquaman sequel by Jake Gyllenhaal. Sony also released a brand new poster for the film, showing all the places the web-head will go this summer. Spider-Man: Far From Home swings into theaters July 5, 2019.